Finding the bird would have been nice, sure, but it was silly to act as though she needed that money to survive. She is a wealthy old lady and didn't need that money in this story. But I am wondering why the sentence is not, "but it was silly to act as though she had needed that money to survive." Would you explain why? I think English has very strict rules in terms of tense. The perfect tense is often optional. The rules relate more to when you may not use it than to when you must. In this case, "to act" is non-finite. It was silly to act how? It was silly to have acted as though she had needed the money. A simple google search led me to this article. Whether we can trust it or not is another thing. Thanks for the link. It's surely pertinent. But this is still a mind boggler. I hadn't even gotten around to thinking of this as a subjunctive. mitsuwao23 it was silly to act as though she needed that money to survive. So we compare this to: He talks/talked as though he knew who Jane was. 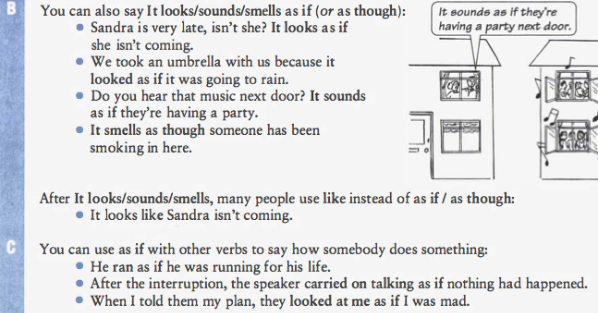 The verb preceding as if / though can be put to a past tense without changing the tense of the subjunctive: . The underlined words are the subjunctives. The main verbs can be present or past tense. It is/was silly to act as though she needs the money. He talks/talked as though he knows who Jane is/was. If these are subjunctives, shouldn't we say "as though she need the money" and "as though he know who Jane is/was"? I am quite confident as though/as if calls for the subjunctive. I've read quite a lot on subjunctive, all articles listing this as an instance where the subjunctive is needed. In your final example sentences, where the words that follow are not hypothetical, we do not use the subjunctive. Regarding your final statement (sorry, I my quote button seems not to be working), I believe you are using the present subjunctive, not the past subjunctive. 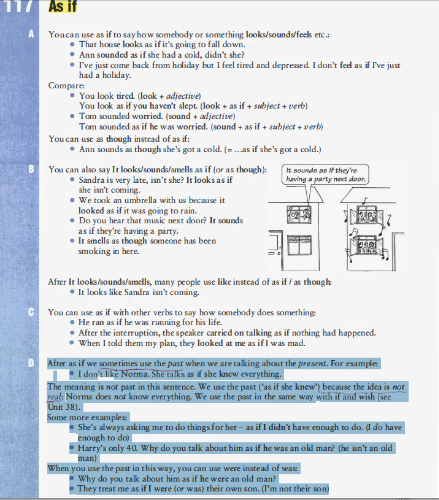 The present subjunctive, used with commands etc, uses bare infinitives. Hello Avangi, Thank you for the reply. He talks as though he knows who Jane is. He talked as though he know who Jane was. He talks as thought he knew who Jane was. He talked as thought he had known who Jane was. "It was silly to act as thought she had needed that money to survive." because she actually is a rich person. But the writer wrote it the way he wrote it. The attachment looked terrible. I hope this works better. Need Some Help For My Poem, THX! The Next World Leader ?